Another image has been making its way around movie sites on the web claiming to be part of the viral marketing for Super 8, but like the last one, I'm going to call it as totally unrelated to this movie. io9 and Movie Web are reporting that this image and a related video of a little girl talking about her experience on a movie set, are related to Super 8. The image first appeared on a hunting facebook page and has since blown up. The image shows a strange creature down on all fours running through the woods towards a camera. It was first posted as being completely real in that supposedly a hunter caught the creature on camera as it was racing towards him... Then it was picked up as a part of the Super 8 viral because a "source close to the production" confirmed it... and finally it's now being passed off as part of the viral marketing for Resistance 3, a new Playstation 3 game coming out. Personally I don't really know what to believe, but I'm pretty confident in saying that this is not part of the Super 8 viral campaign, but like anything, I guess you never know. You can find the image above and all the sources below, and you can form your own conclusions. the creature looks like meagan and chris!!!!!!!!!! i know isnt it scary how similar it looks to me? we have nothing to suggest the whole film is totally set in the 70’s. Still i’m pretty sure if they where going to show us something from the movie they would make us work a little harder for it. It has nothing to do with Super 8. The image first appeared on a news broadcast, when a teenager, who wanted to remain nameless, sent it in claiming to have seen this. It has been debunked as photo-shopped. It has absolutely zero involvement with Super 8. Just so everyone knows. I’m sure you can youtube the clip of the news, & it is a real news channel & the real people, so don’t think it’s viral from Super 8. My question is ,why not? Why can’t it be part of super 8 . The weird thing aboot the date is that it was the same time Josh met his black market fish friend. I don’t think that this dude in the forest is the super 8 creature but maybe something that survived the whole 70s show . Maybe a offspring or a pet most likely its baby . the picture got me more stoked for S8 when i thought it might be apart of it. I highly doubt that’s the real creature for Super 8. But the creature is not that bad for a monster movie, get rid of the glowing eyes though. You will soon find an answer to all of your life’s questions. Could it be a fake?? and all say the same sort of stuff. those other two were trolls from unforum. compare the posts from the other two to the original facebook josh minker. and besides, why did facebook officially remove the other two trolls and leave the original Josh Minker?think the bad robot ARG team contacted Facebook to remove the false ones. There’s A New CHAT available!!! Check it out!!! No this is not linked to Super 8, I have seen this picture before.. I almost want to say before Cloverfield as fan art…. just food for thought. These are pictures from a dear cam video. I heard the video is out there but where the F is it??!! 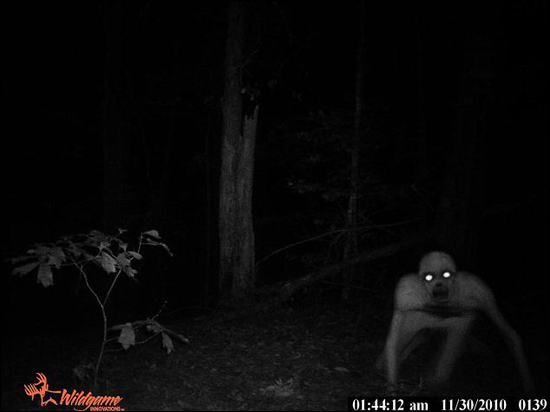 Hey ive seen some creature like that on a video on youtube here is the link if you can see the same: http://www.youtube.com/watch?v=TfMUk1MV3rw its just like the picture in the woods! i know that three dots (depend on how they are placed) mean therefore or because. it was going around where i live for a little while as a text saying that someone had captured that on their woodland surveillance camera.